ANNOUNCING: Gourmet Preserves For Sale! With SO much interest in my old-fashioned, no pectin added, gourmet preserves, we’ve started ‘putting-up’ jars in limited quantities to sell on a first-come first-served basis. ~ Bill & I think this is a very tasty jam. And we like the soft silky jammy texture even though the 2012 Sonoma County Fair judge commented: “Interesting flavor. A little too soupy – not enough pectin? Tough competition. Don’t give up.” Of course, the judge wasn’t aware the only pectin in the jam was all natural (not packaged) from the oranges in the jam. 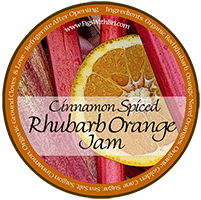 INGREDIENTS: Organic Red Rhubarb, Organic Navel Oranges, Organic Golden Cane Sugar, Sea Salt, Ground Saigon Cinnamon, Organic Ground Cloves & Love. For MULTIPLE jar orders, select applicable Priority Mail shipping rate (see list below) in the cart for the 1st jar. 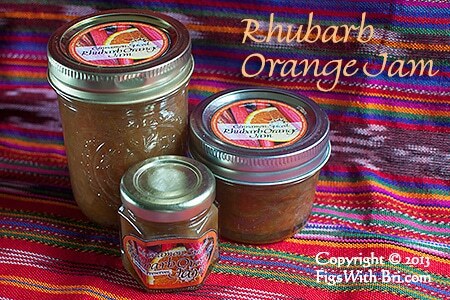 Select FREE shipping for additional jars or the shipping fee will be overcharged. Pick-Up at our Prescott. AZ address. Email for directions and to coordinate a time. We’re happy to do international shipments, too. Will research those costs if you express interest via an email or leave an inquiry in the comments. About Cynthe & Marc… and our beloved Bri.